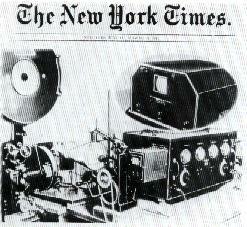 Above is the world's first television set invented by Manfred von Ardenne in 1931. See the book "Die Erinnerungen" by Manfred v. Ardenne. 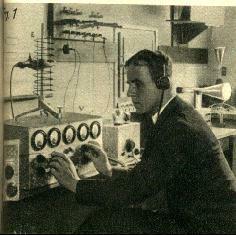 Hans E. Hollmann working in the Heinrich Hertz Institute in 1929. A CRT (Braun tube) is in the background. 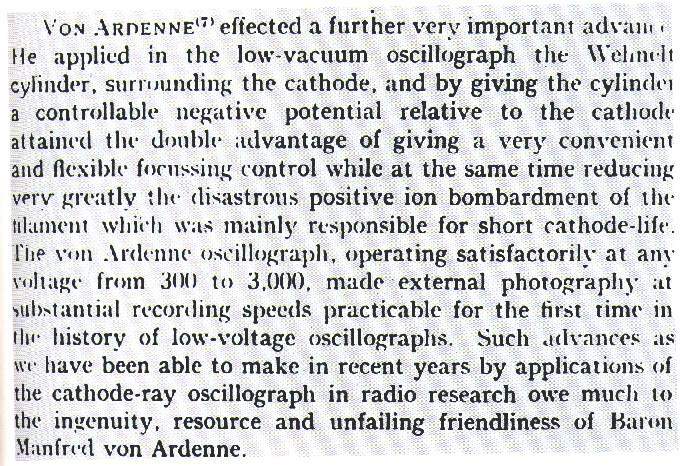 Below is a clipping out of Watson Watt's book, "Applications of the Cathode Ray Oscillograph in Radio Research" published in 1933. The books give v. Ardenne much of the credit for perfecting the CRT. 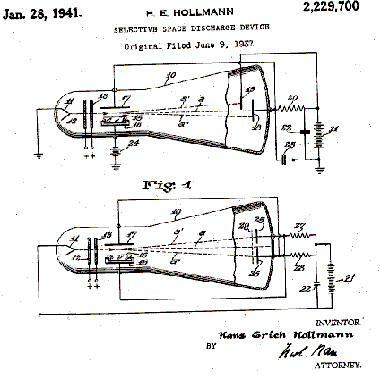 In 1929 and 1933 Watson Watt visited Hollmann and v. Ardenne in Berlin and was inspired by their work. He purchased over 100 CRT's from v. Ardenne. 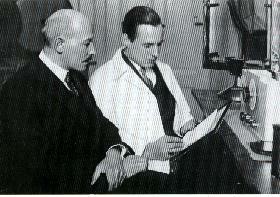 Dr. Loewe and v. Ardenne in 1928. Loewe financed v. Ardenne in the early years. Hollmann and von Ardenne had adjacent laboratories in Lichterfelde, Berlin. They were good friends from early childhood and worked together on many projects before and during WWII. 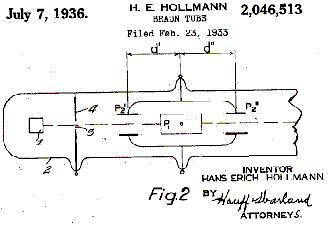 Below are some of Hollmann's patents on CRT's including "Braun tube" modifications. 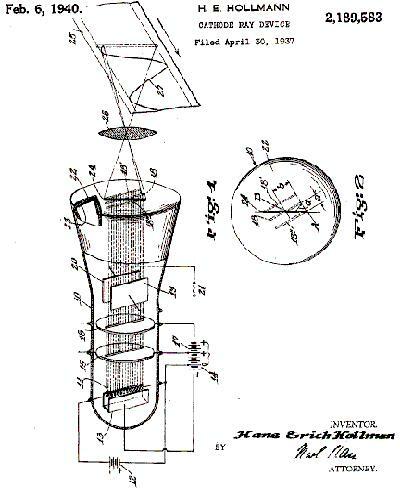 Hollmann was the first one to recommend using the CRT for radar at GEMA and despite the objections of the Navy it was the correct thing to do according to Erbsloeh. 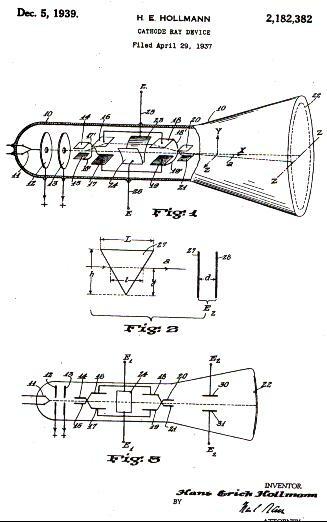 Hollmann and v. Ardenne worked on the Plane Position Indicator, PPI, used in the "Panorama" radars. In 1936, at a conference at Bad Salszbrunn, von Ardenne proposed using the polar-coordinate-oscilligraph for radar. 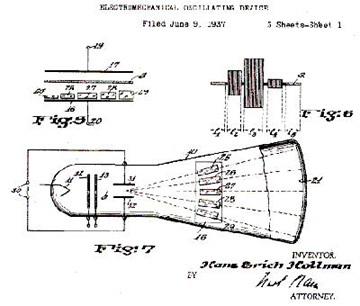 The PPI is used on all modern radar sets today. See radar development in Germany for the first "Panorama" radar in the world that used the PPI.